The 17 March 2016 cover of Informer featured a photograph of Stevan Dojcinovic, editor-in-chief of the Crime and Corruption Reporting Network (KRIK), with accusations that he was part of a “mafia” trying to bring down the Serbian government. The front page of Serbian tabloid Informer stands out from the other newspapers displayed at Belgrade’s countless cigarette kiosks. Its red and yellow coloured headlines scream in block capitals at everyone who passes by. It is the word “Mafija” that attracts most attention on the morning of 17 March 2016. It’s printed on the front page, as is a blurry photo of a journalist. The journalist, Stevan Dojcinovic, is editor-in-chief at Crime and Corruption Reporting Network (KRIK). 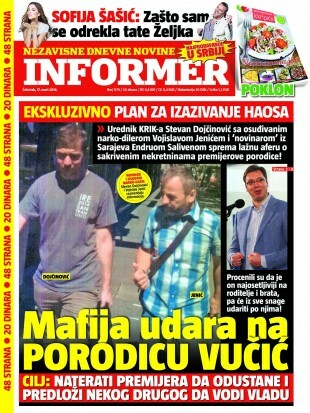 The headline translates: “Mafia is planning attack on family Vucic.” According to Informer, Dojcinovic and his colleagues at KRIK are the mafia and want to bring down the government of Serbian Prime Minister Aleksandar Vucic. Psychological attacks on KRIK by the tabloid have happened so often that this was hardly surprising. KRIK has become well known throughout Serbia, not because of its investigative reporting, but because of the attention from Informer. Informer was founded in 2012 and its editorial coverage has been called “pro-regime oriented” by Konrad-Adenauer-Stiftung, a German political foundation. The paper’s editor-in-chief, Dragan Vucicevic, is said to be a close friend of the prime minister’s. Since its launch in July 2015, KRIK has published a series of revealing stories about corruption and misuse of office by several high-profile government officials. And ever since, KRIK has been targeted by Informer: KRIK journalists have been called foreign spies trying to bring down the government; they have been accused of spreading lies; they have been personally discredited on Informer’s front pages. It began on 7 September 2015. KRIK published leaked footage showing one of the biggest drug lords of the Balkans meeting with Ministry of Police officials, including Ivica Dacic, a former prime minister. The video was posted on the KRIK website and caused immediate controversy. A day after the revelation, Informer published an article stating that KRIK was involved with opposition parties and that Dojcinovic is a “Western spy” backed by US embassy staff. On 19 October KRIK published a thorough investigation into Belgrade’s mayor Sinisa Mali, who allegedly owns offshore companies dealing with selling apartments at the Bulgarian coast. Exposing Mali, who is a political ally of Vucic’s, soon sparked a new round of allegations by Informer. Early November 2015 Informer claimed that KRIK, as well as two other independent media organisations BIRN and CINS, were given foreign grants for publications of “false affairs against people close to the government”. Informer’s Vucicevic said on national broadcaster TV Pink, in a special 4-hour-long programme called “Bringing down Vucic”, that the media organisations were planning a step-by-step plot to bring down the government. Serbia’s journalist unions condemned what they called a smear or lynch campaign. The chairman of the Independent Journalists Association of Serbia (NUNS), Vukasin Obradovic, said that Informer created “an atmosphere of fear and lynching in the society, which may have serious consequences for the personal safety of the journalists involved”. But the investigative journalists from KRIK were not scared off. They were, in fact, working on their next investigation into another government official: the minister of health, Zdravko Loncar. KRIK found out that Loncar had been involved with Serbia’s most notorious criminal gang known as the “Zemun clan” when he was still an unknown doctor working at an emergency ward back in 2002. He allegedly had received a free apartment as a reward for “finishing off” a severely wounded gang member by “injecting him with a fatal cocktail”. KRIK published the full story on February 22. A day later Dojcinovic’s photo was featured on the Informer’s front page again. The article stated that KRIK’s editor-in-chief was “launching false scandals” and was “intentionally creating chaos in the country”. Health minister Loncar was invited to talk on TV Pink, where he did not respond to the allegations but instead accused KRIK of not paying taxes. Up to that point KRIK had investigated cases of corruption involving high-profile state officials in Vucic’s inner circle. But what everybody was waiting for was an investigation into Vucic himself. Then came March 18 2016. Informer once again published a photo of KRIK’s Dojcinovic on its front page. But this time it was different. The tabloid revealed a story KRIK had not yet published about Vucic’s large real estate assets in Belgrade, which he is supposedly hiding under the names of family members. Informer exposed details of an investigation by KRIK that they could not have obtained in an ordinary manner. According to KRIK, the Informer appears to have relied on information that could only have been gathered through secret service surveillance techniques including physically following journalists and phone tapping. Currently KRIK is still working on finishing their newest investigation, which is indeed about Vucic’s real estate assets. But meanwhile Dojcinovic fears for the fate of his sources. “We’ve now seen that they know exactly who we are meeting with. There is pressure on our sources, most of them work in state institutions. Some have already been fired,” Dojcinovic said. Mitra Nazar is a Mapping Media Freedom correspondent and journalist based in Serbia.